The photo of this boat raises numerous questions, all of which are answered with precision in the Duck Tour FAQ. 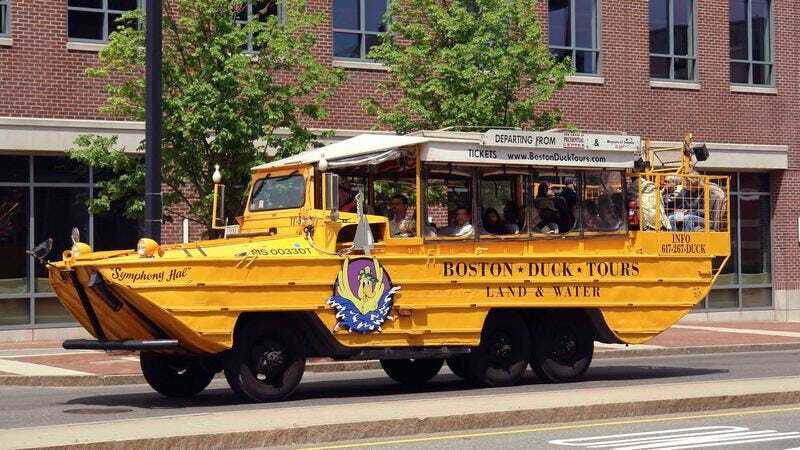 BOSTON—With its abounding reams of critical information, BostonDuckTours.com’s Frequently Asked Questions page goes to great lengths to eliminate even the slightest hint of confusion that may arise when it comes to touring the city via amphibious “Duck” vehicles, company officials said Friday. Those unclear about the tour’s three departure points, how to get there, and where to park, can scroll down to the center of the FAQ, where the questions “What is available at the Prudential Center, how do you get there, and where do you park?” “What is available at the Museum of Science, how do you get there, and where do you park?” and “What is available at the New England Aquarium, how do you get there, and where do you park?” are addressed in full. According to those who have consulted the FAQ page, its lengthy discourse on the Duck Tour’s myriad procedural details has been an indispensable ally in planning their trips to Boston. “To be honest, I’d be completely lost without it,” he added. Ingbretson confirmed that he would be taking a printout of the FAQ section with him on his trip, just in case any unexpected questions came up.